A red, yellow, and orange bell pepper on a cutting board. The nightshade family, Solanaceae, has many familiar members: potatoes, eggplant, tomatoes and peppers -- including bell peppers. Although the nightshade family has a bad reputation due to a few poisonous members, bell peppers are safe and an excellent source of nutrients. Some members of the nightshade family, including Atrope belladonna or "deadly nightshade," contain harmful compounds called alkaloids, which, when consumed in large quantities, can be lethal. Bell peppers do not contain the toxic alkaloid, called solanine, and are perfectly safe for consumption. Bell peppers are a rich source of important nutrients, including vitamins A and C. The green, yellow, red or orange fruits also add fiber to your diet, which is good for bowel health. Bell peppers make a delicious, crunchy snack when served raw. Simply core the fruit to remove the seeds and cut into slices. 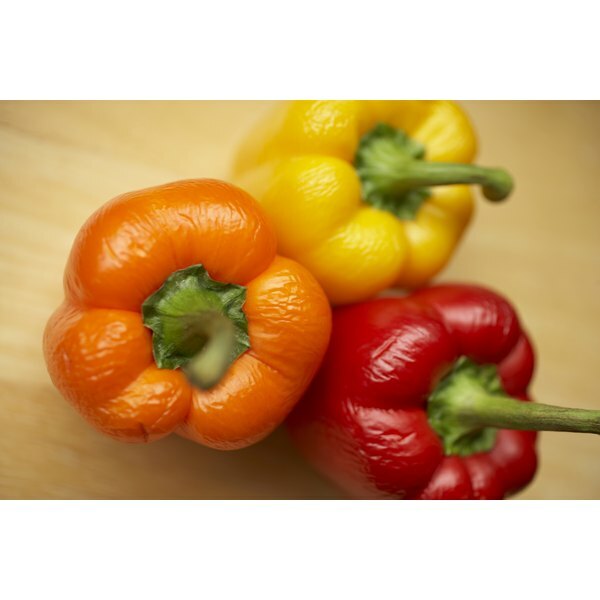 You can also add bell pepper to stir-fry, casseroles, soups, stews, sandwiches and salads.